Last week’s adventures took me to the nearby Nachal Ga’aton, a small stream that starts seasonally between Mi’ilya and Meona and drains into the Mediterranean in the heart of Nahariyah. 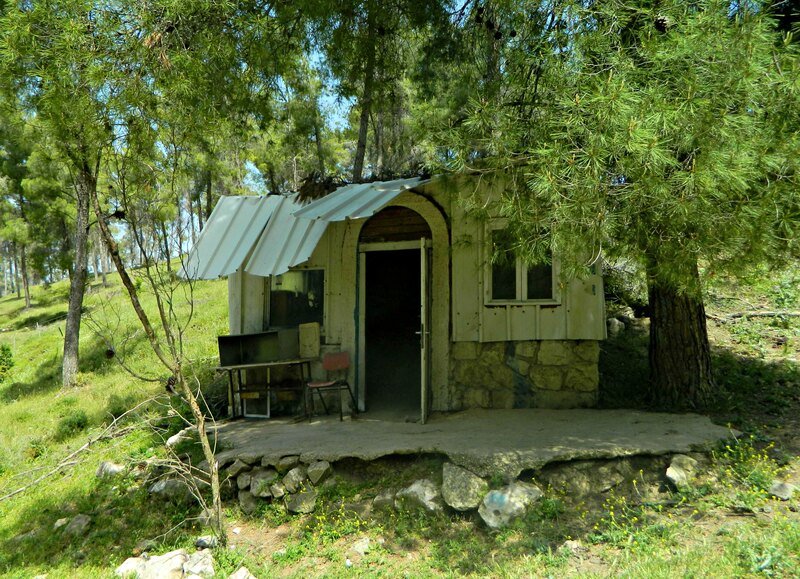 Being that Meona and Mi’ilya are neighbors with Ma’alot here in the Galilee, my father easily dropped me off in Meona and I began my 13-kilometre hike in the industrial section of the town. Eager to leave the rank smell of chicken coops behind me, I skipped some interesting little things to see, hurrying along on the paved road. It was when passing a mushroom manufacturing plant that I finally got on the Nachal Ga’aton trail (marked blue). 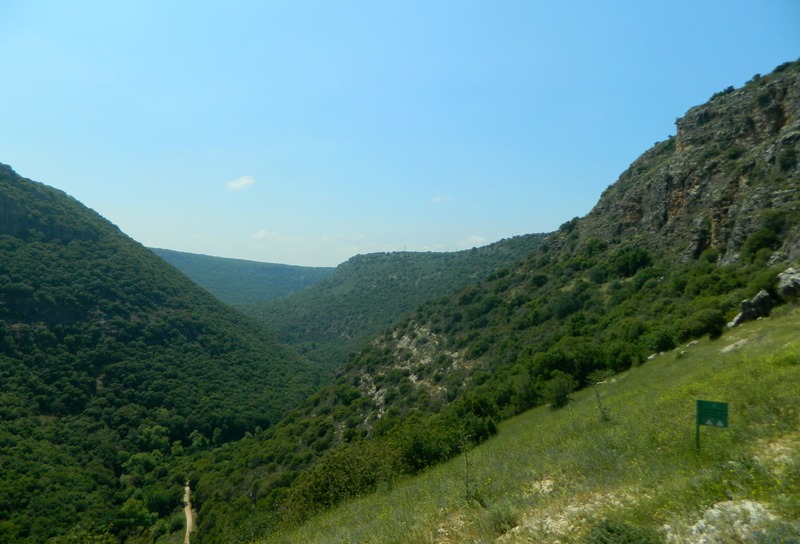 Immediately descending into the woods, the trail followed the dry Marva stream (below Tel Marva) until it reached the dry Nachal Ga’aton. The hike was rather uneventful until suddenly I spotted a wild boar in the bushes up ahead. It was nosing around in the leaves and didn’t notice me. I began to quake in my shoes, considering my options. Making a snap decision I took a few silent paces back and then strode forth with a false sense of confidence, making sure to make ample noise. Pretending like I didn’t notice the beast worked rather well, and, after a gut-churning grunt/snort, the wild boar dashed up the gentle slope, followed by four other boars. Seizing the opportunity, I found myself a nice stick to be my protective companion. A few minutes later I crossed paths with an elderly man holding a huge club – no doubt his tried-and-true boar crusher. Continuing along the dry rock-filled streambed I spotted yet another wild boar. Due to the fact that I walk rather quietly (a practice harkening back to my youth when I chased whitetail deer in Michigan’s bountiful nature parks), and the fact that I was upwind, I always see the wild boars before they detect me. 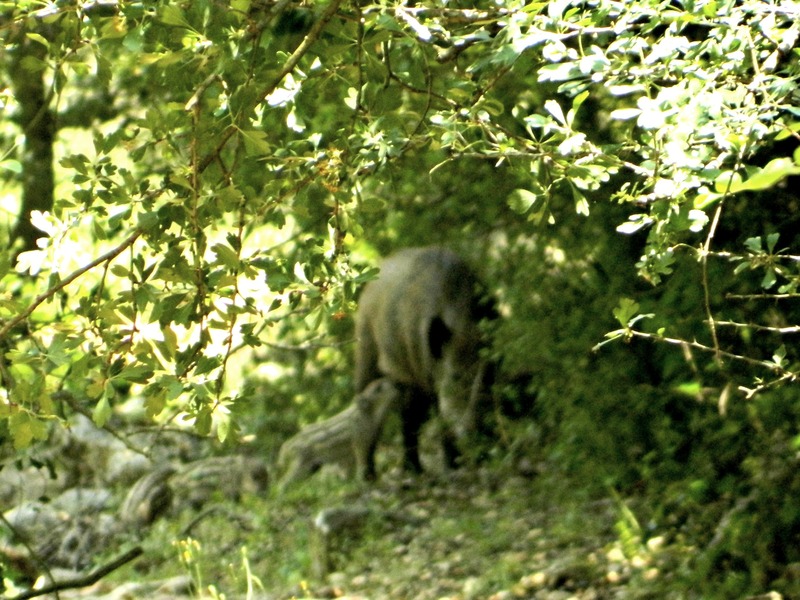 I stepped back a few paces and began filming the boar edging into the woods when, suddenly, I spotted two striped piglets on the trail headed my way. Backing up away from the advancing piglets, not wanting the mother to spot me and think bad thoughts, I kept going further and further back – and the curious little squeakers kept coming. There were some noises in the bush and the piglets left me. Waiting a good five minutes or so, I figured it was now safe to continue – but just as I passed I saw a boar just mere feet from me in my peripheral. It just grunted as I walked by, and my heart skipped some beats in fear. Resorting now to dragging my stick on the ground beside me, making plenty of noise, I next reached a clearing with many large eucalyptus trees and picnic tables. 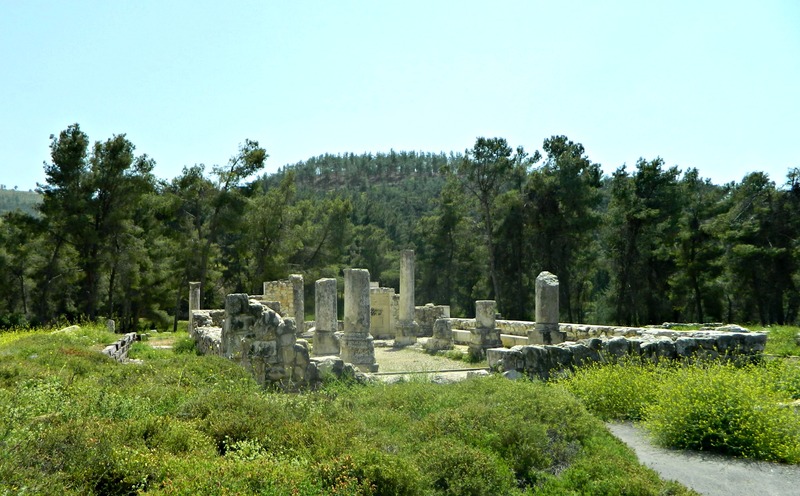 It was there that I had lunch, and continued on in the direction of some nearby springs, reaching the beautiful Ga’aton ruins with ease. 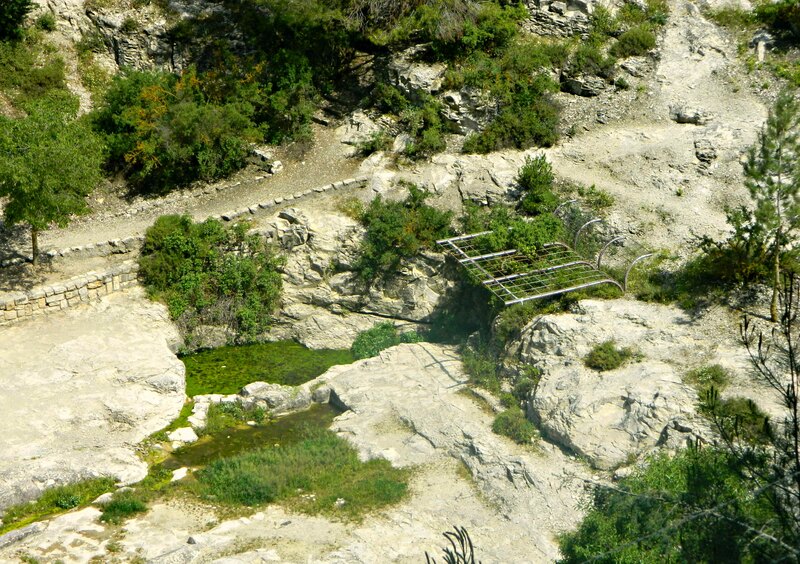 It’s at these ruins that Nachal Ga’aton finally sees some water and beside the bridge is a little pool perfect for children. 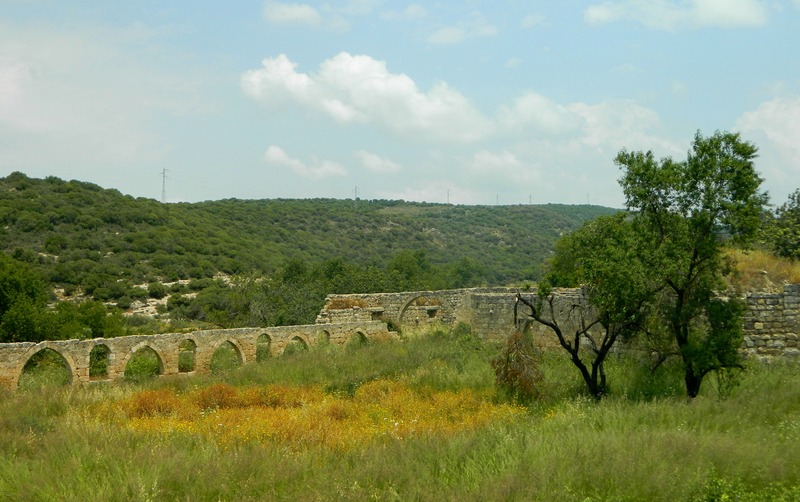 As it is spring- the season of growth, the ruins were overrun with tall grass and wildflowers and I was slightly apprehensive of running into a snake or two – and being that this wasn’t my first time visiting the ruins, I was content with visiting just one building. 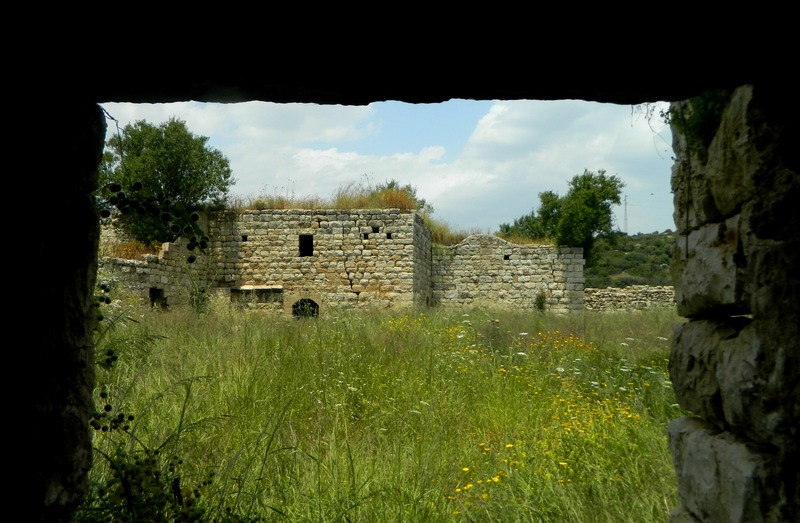 The ruins were most recently a Ottoman farmhouse owned by the Sursuqs of Lebanon (one of Beirut’s aristocratic Christian families) having been built on old Crusader remnants. Climbing to the second floor of one building, I found a nice place to sit and look out at the ruins below – watching a kestrel fly about searching for prey. 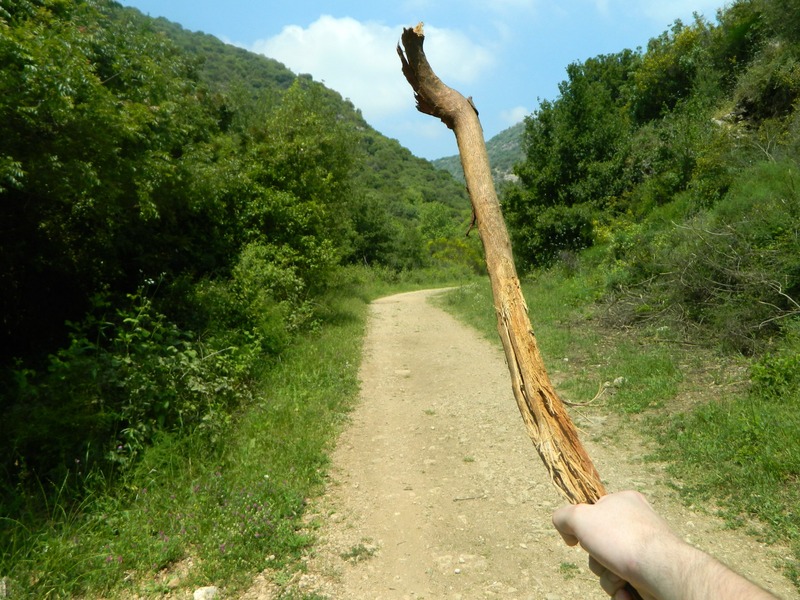 After sitting for a spell, I took up my walking stick and left the ruins, walking along the now watery Nachal Ga’aton. 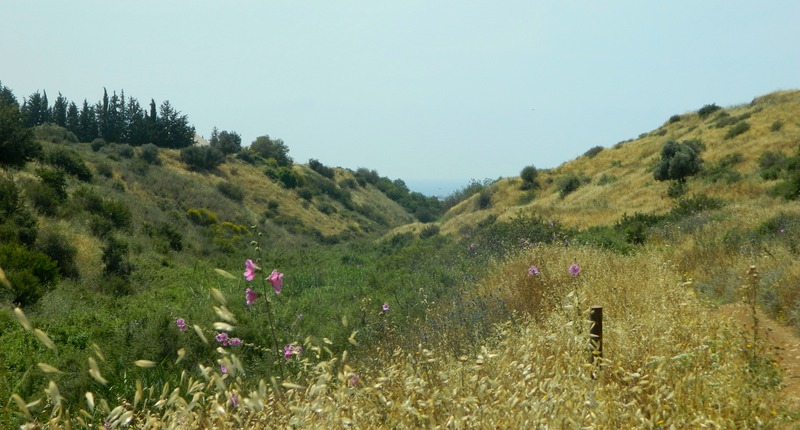 When I hit Road 8833 (the road to Yehiam and Ga’aton), I turned right towards the large quarry and then took the bike trail in the direction of Kabri – still walking parallel to Nachal Ga’aton. It was on this nice bike trail that I saw an enormous grasshopper, almost mistaking it to be a small bird. Heat waves rose up on the trail before my eyes, and the hollyhocks added a nice splash of colour to the various shades of brown and green looking out to the sea. Soon I reached netted banana fields flanking the trail, and then, just half a kilometre from Road 70 and the Kabri Junction, I came upon the Western Galilee Regional School and swung north on the access road to visit the last two things on my mental checklist. 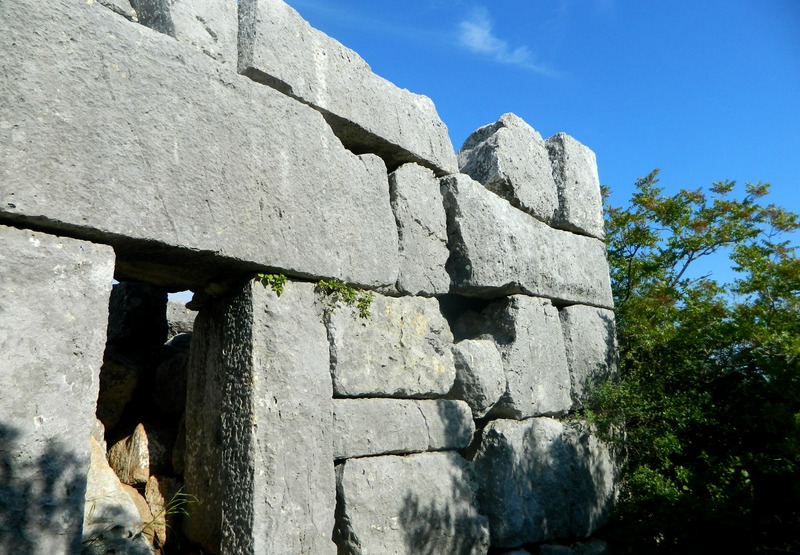 The first was the KKL-JNF Kabri Archaeological Park, which is free to visit although they prefer prior reservations. Inside I found three themes of artefacts: olive oil, corn and wine. 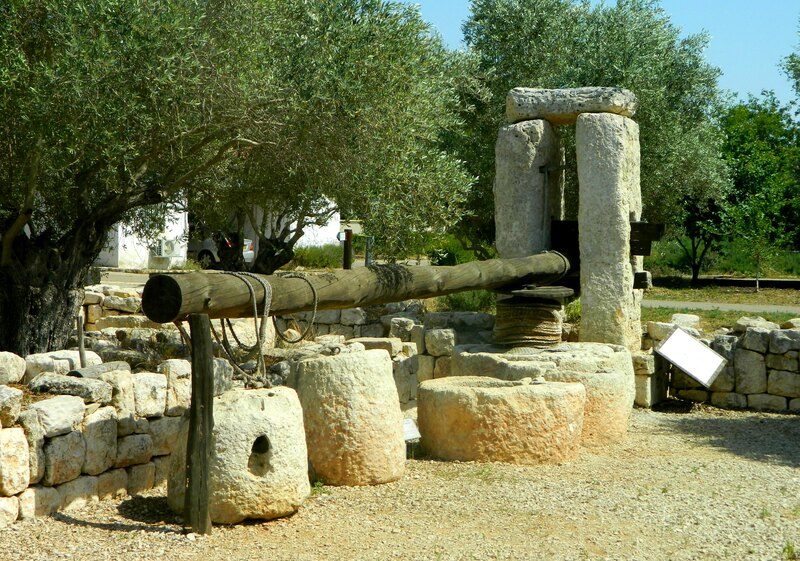 The largest is the olive oil section, with many grindstones and presses from different time periods and locations including a reconstructed Roman-era olive oil press from the Zabadi ruins just 5.5 kilometres north near the Old Northern Road. Then there are four types of corn grinders starting with the archaic saddle quern and then the most modern rotary hand mill likely introduced to the area by invading Roman soldiers. And finally, a winepress from the Tanach period excavated at the foothills of the Gilboa range near the Jordan River Valley. 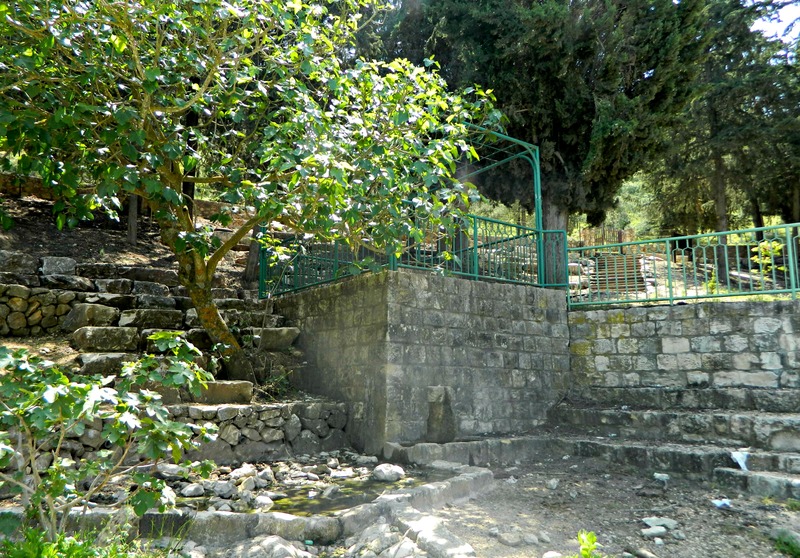 Using giant blades and diamond-toothed chainsaws, KKL-JNF and the Antiquities Authority were able to extract the 24-ton behemoth from the bedrock and transport the intact winepress to the park to be exhibited. I think it would be cool if they bottled and sold wine made from the press, or at least had hands-on activities on-site. 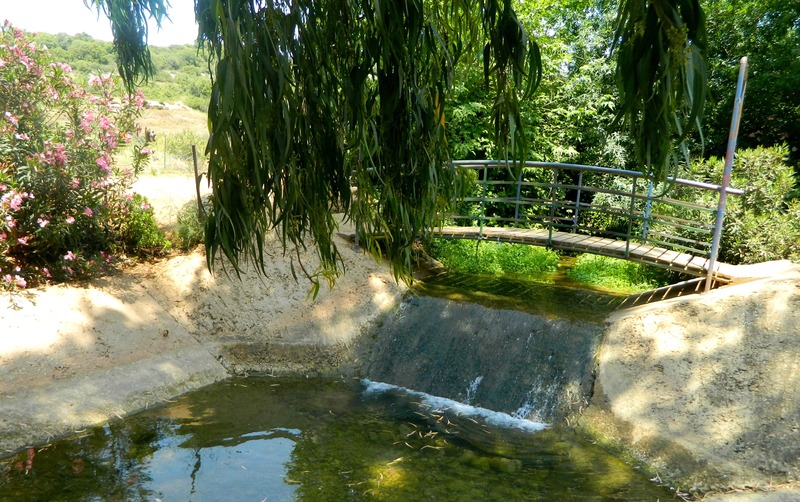 When I finished at the archaeological park I went across the access road to the remains of an ancient flour-mill which likely used water from the stream to power the grindstones. Nachal Ga’aton keeps on flowing all the way to Nahariyah, slicing through the centre of the city and then empties into the Mediterranean but I wrapped up my trip where I was, taking the bus back home – my first time paying for public transportation since being released from the army. Last week, in attempts to ensure I take at least one bloggable trip a week, I turned to my own backyard – Nachal Kziv. 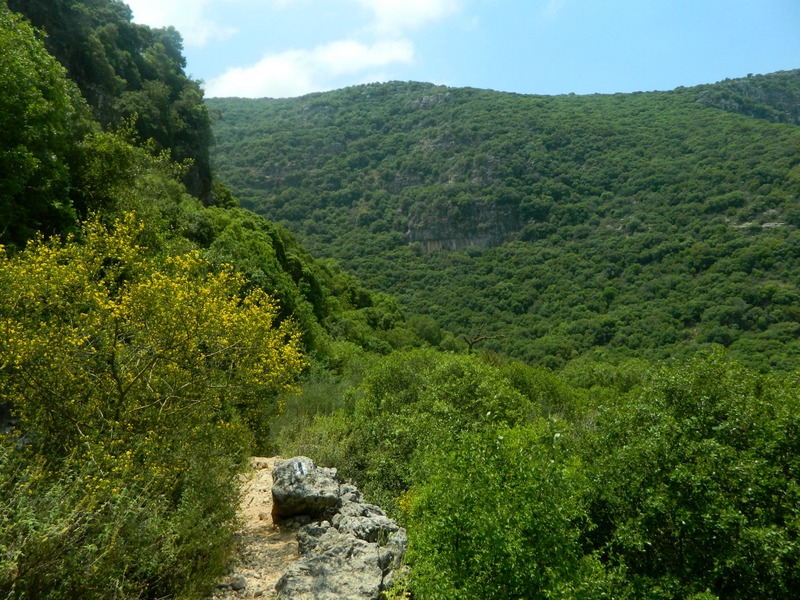 While this is my third post (after I and II) about this beautiful stream that snakes across the Western Galilee, the focus of this trip wasn’t really the stream itself but rather the sites on the flanking mountains and cliffs above. And so, I set out in the late morning from the Zeitim neighbourhood of Ma’alot, walking the winding paved road down to the stream. I had an optimistic feeling that I’d see some interesting animals – ideally the Persian fallow deer, which I’ve only seen once before. 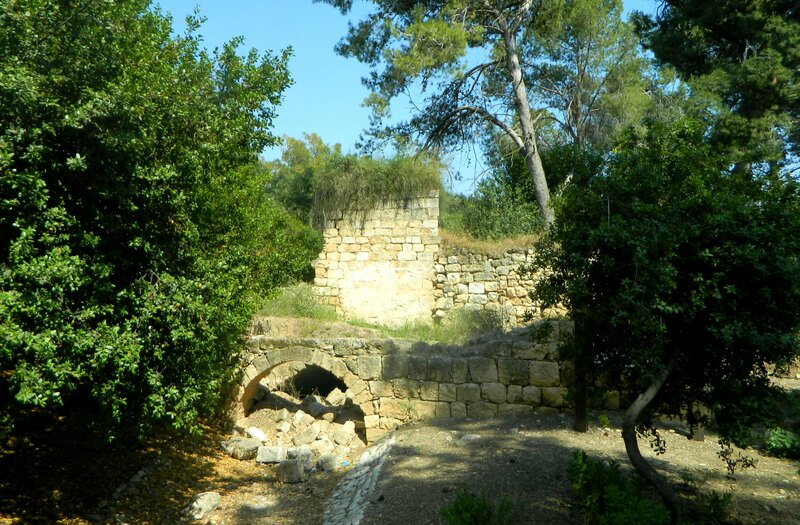 I reached the water at Ein Ziv and passed the Crusader mill, walking along the stream. After crossing the stream once, I spotted somethings dark and foreboding up ahead on the trail. They spotted me just moments after I had spotted them, and the wild boars stepped out to size me up. If perhaps to set the dangerous scene properly – man vs nature – an unseen wolf began to howl nearby. Knowing that I was doomed if I were to continue as is, I backed up out of eye-line and found a hefty stick to wield, just in case. When I returned to where the wild boars were, I found that they had disappeared into the woods. Phew! 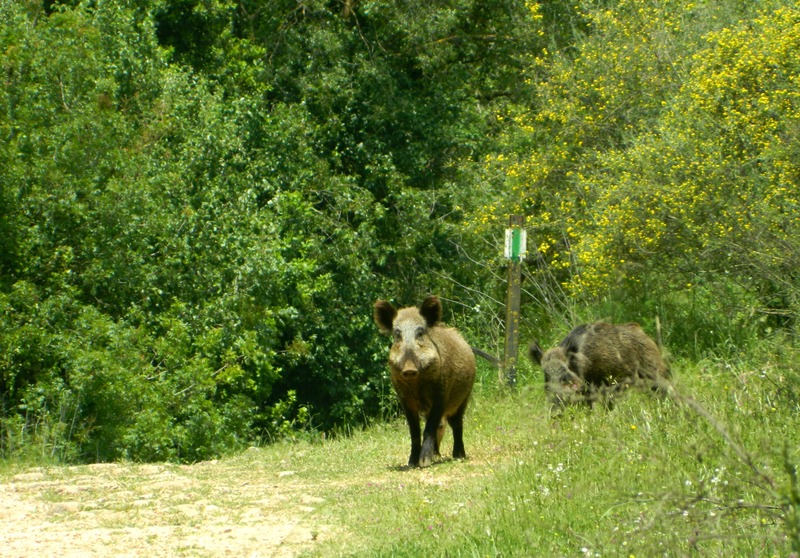 I had avoided a frightening confrontation… Now, just to clarify, wild boars are the absolute worst animal to run into while hiking in Israel. While not inclined to attack you, the wild boar is certainly self-assured that it could put a mere human in his place – and at a maximum weight of some 300 kilo (660 lbs), their opinion is justified. 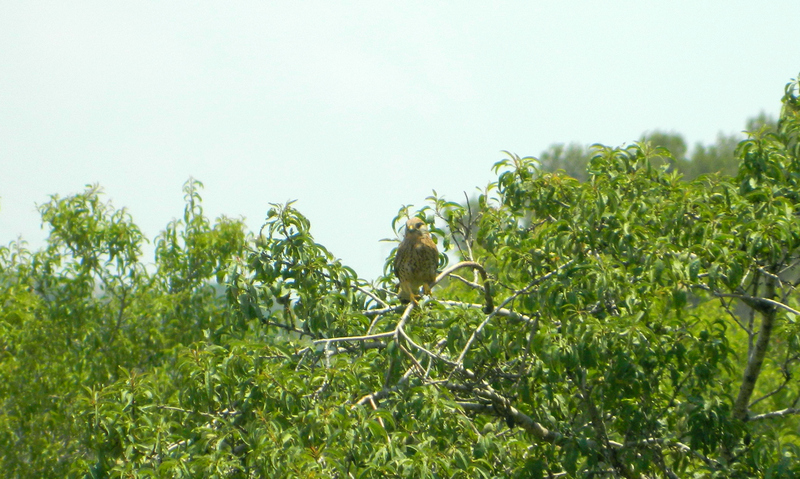 The ones I came across, including those pictured above, are relatively medium-sized females. Some more frightening facts about the wild boar is that they can upturn rocks weighing 45 kilo (100 lbs), they can run 40 km/h (25 mp/h) and they can just jump to the height of 140-150 cm (4.5-5 feet) in the air – plus they have large canine teeth, which grow into wicked tusks on the males. 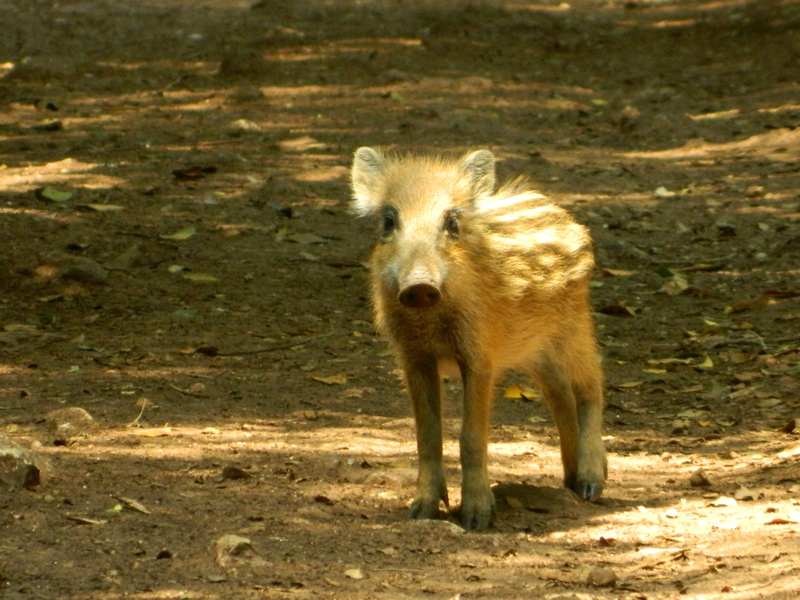 The wild boars in Israel have no real natural predators, other than the wolf, which could probably only take down a juvenile boar. While most wild animals in Israel run away when they see humans, these wild boar first stood their ground and then issued a threatening rumble which sounded exactly like any subsonic noise portrayed by a troll in the movies. Slightly on-edge, I continued on with my hike on the easy gravel trail until I reached the sign marking the black trail to Abirim Fort and turned to climb the mountain. 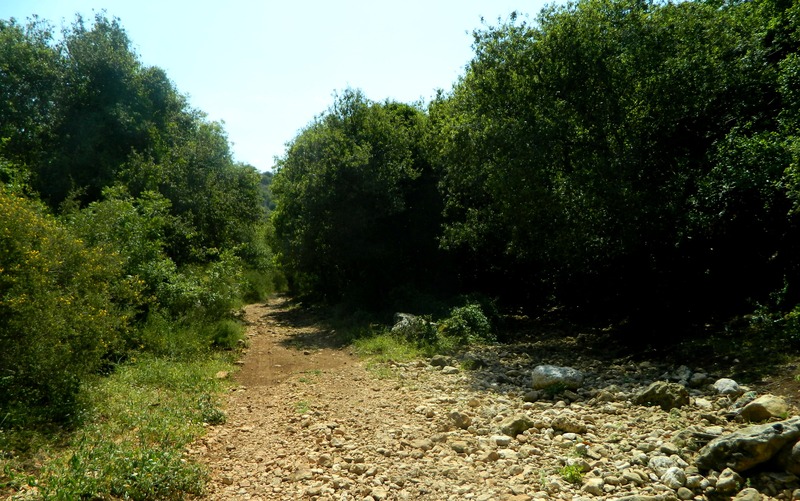 A far more rugged trail, I was occupied with my progress when suddenly I heard a very loud rumble/snort of a wild boar (or many wild boars) very close by, far too close for comfort. I immediately dashed for a tall rock where I would stand my ground in relative safety. I could hear the boar(s) and I was sure they could hear me (and my panicking heart) but I could not see them. 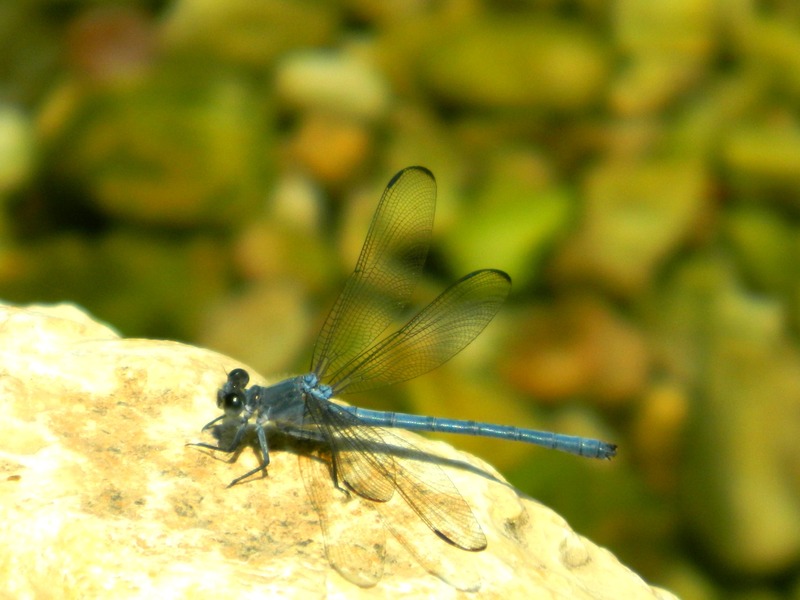 I strained my eyes, looking through the underbrush and among the large rocks – nothing. After a few minutes had passed, I inched over to a tree and climbed it before announcing my presence. With no bone-chilling swine calls echoing my own shouts, I felt reassured that I was back to being alone and continued up the mountain, tightly gripping my hefty stick. I tripped over some random wire in the grass as I found my new high ground and waited for these wild boars to either attack me or disappear. Thankfully, they vanished and I was able to continue on to the clearing where the blue trail for the Temple Cave started. Feeling a sense of déjà vu as I hiked back downhill, just on the adjacent slope, I marveled at the familiar sight of Ma’alot over the canopy of mountain green. I then came upon a fork in the trail, and correctly took the left path after checking with my phone’s GPS. 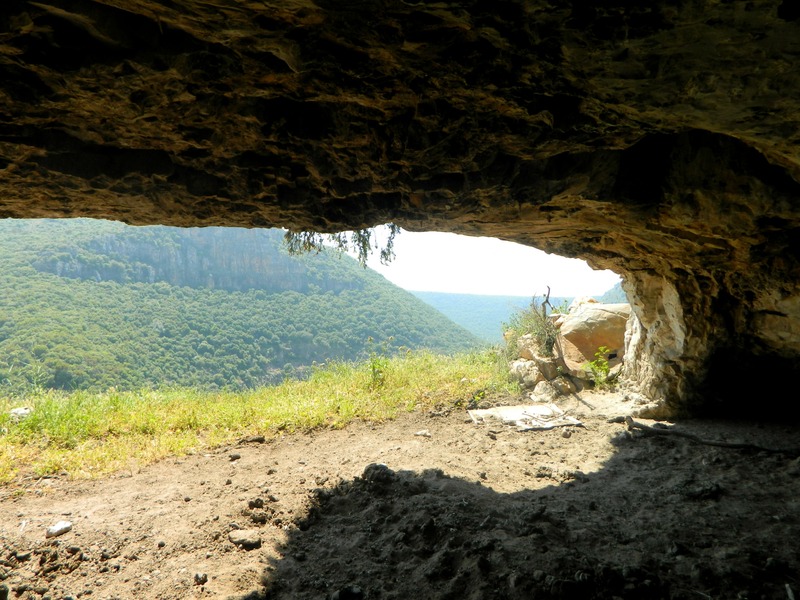 As I walked the precarious trail overlooking the Nachal Kziv path down below, I noted that I had not seen a single person on my entire hike thus far – and then the sloped field of the cave came into view. 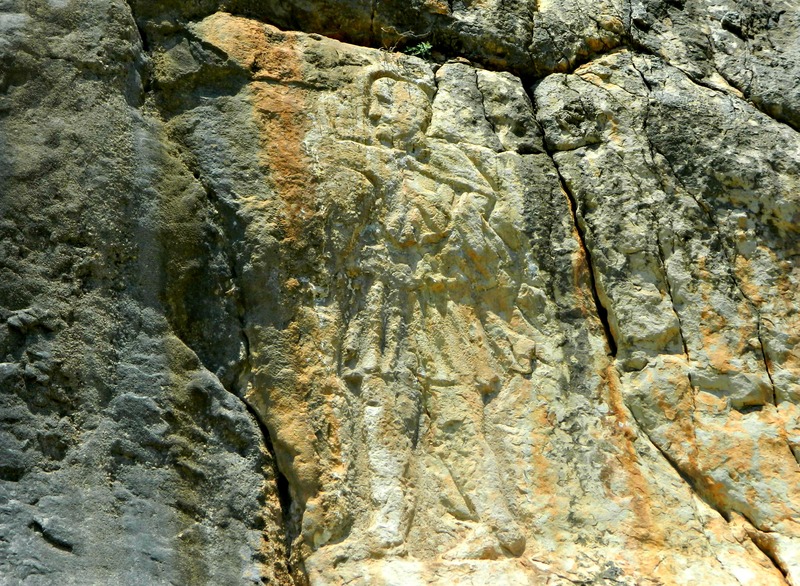 I found the explanatory sign and looked up at what I came to see – a life-size carving of a Roman soldier on the cliff wall. Only rediscovered in 1985, this “Man on the Wall” is believed to be over 2,000 years old and mystery shrouds its origins. Beside this fascinating find is the multi-chambered Temple Cave, which I entered to find a burnt ceiling and a powder floor. There was also a lone bat, which disappeared, but I found no history or backstory of the cave, nor the origin of its name. After a quick little picnic next to the cave I began the return trip to the clearing, spotting wild boars – yet again – on the trail far below. 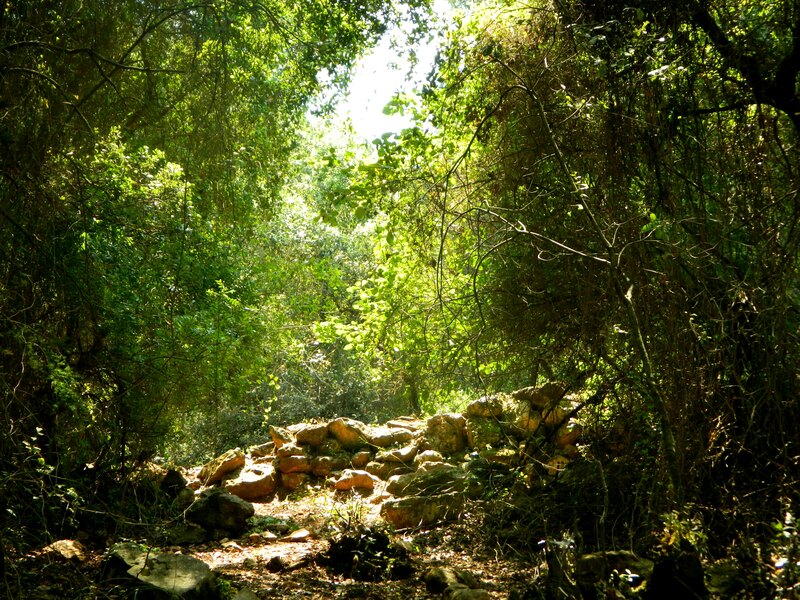 I reached the clearing without incident and then continued back on the black trail towards Abirim Fort. Having been going downhill, then uphill, then downhill, then uphill over and over, it was a relief to be on a relatively flat trail. 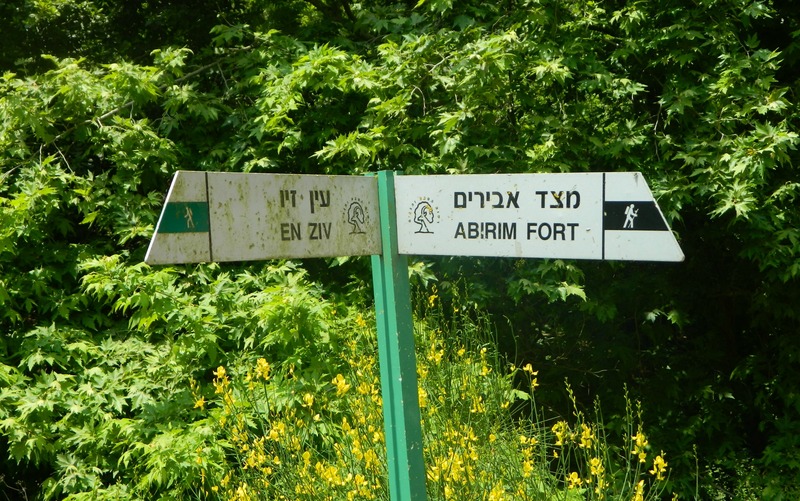 At last I reached a sign for Abirim Fort and somehow missed the side trail to the ruins, continuing on towards the end of the trail. 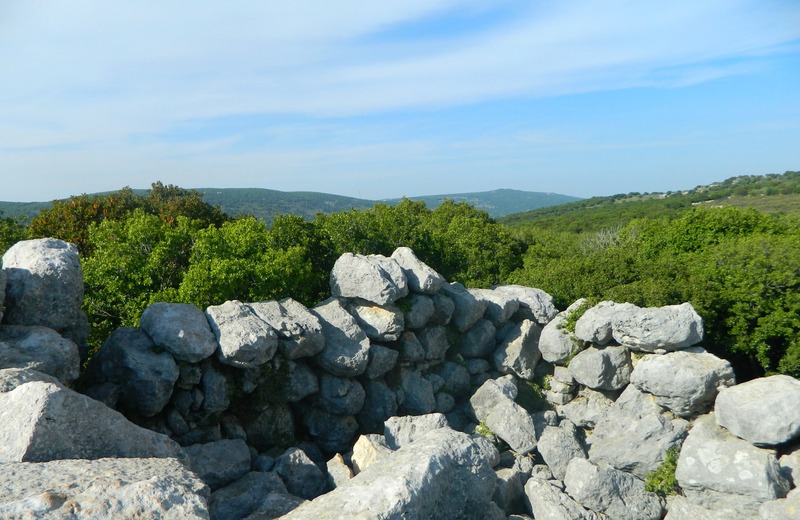 Turning back, I located the white trail and entered a thicket of small trees, shrubs and large rocks in search for the ruins. I got lost remarkably quickly and it took a very long time for me to find Abirim Fort. When I did finally spot the large light grey ashlars, I climbed up and enjoyed my achievement. Long thought to simply be a fortified Crusader farm, the structure is now believed to have originally been a Roman mausoleum – due to its huge stones and small door. Attempting to leave the fort, I got lost once again in the impossible thicket. I fell back on survival instincts and battled the endless branches and thorns – forcibly tunneling my way out through the relentless vegetation. At last I emerged on the black trail and reached the road with ease, where I waited for my parents to retrieve me – thanks parents! Last week my parents and I took a little drive over to the Biriya Forest with two main destinations in mind. However, due to the Galilee being absolutely filled with interesting things to see, the drive turned into a full-fledged day trip. Our first stop was the Shamaya and Avtalyon mikve (ritual bath) and we then turned eastward at Meron Junction and stopped at the roadside kever (grave) of R’ Benaiah the Amora and unnamed others who lived during the 200’s CE. We lit some memorial candles and had a quick prayer before continuing on with our “kever hopping” of Tannaim and Amoraim (Jewish sages from approximately 20 CE to 500 CE living in the Land of Israel and Babylonia). 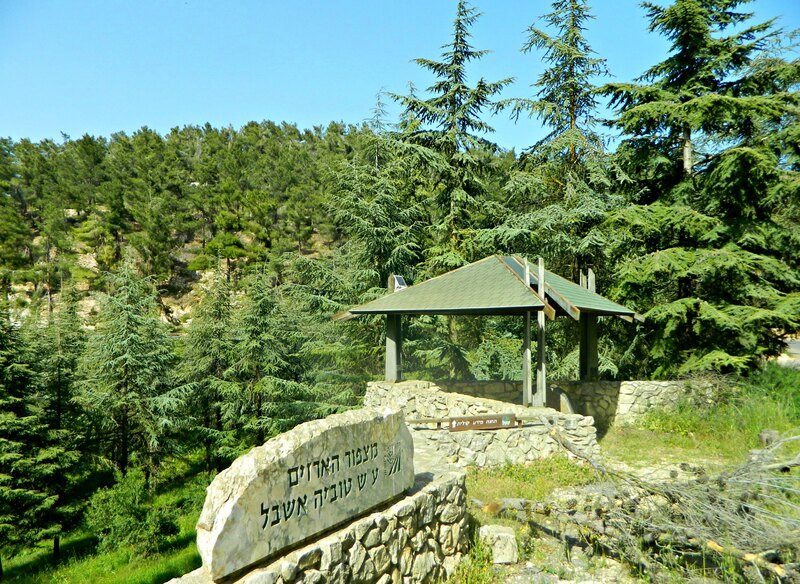 Our next stop was just around the bend at a trail entrance of Nachal Amud, the hillside kever of R’ Kruspedei the Amora (likely “ϰρασπδον” in Ancient Greek) who’s mentioned several times in the Zohar. We then took the backwoods road to the agricultural community of Kadita, stopping off at the kever of R’ Yossi ben Ya’akov, one of the disciples of the great R’ Shimon bar Yochai. 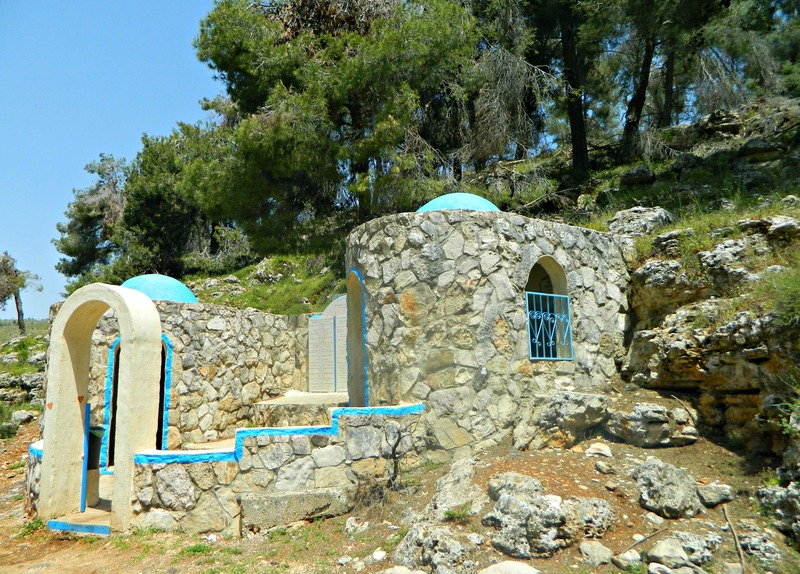 In fact, the domed room on the right is known as the Idra Zuta, where Rashbi taught his final Kabbalistic teachings to his students on his deathbed. After more candle lighting and praying we got back in the car and continued to the kever of R’ Tarfon, one of the most famous Tannaim who lived in the era of Bar Kochba’s revolt against the Romans. 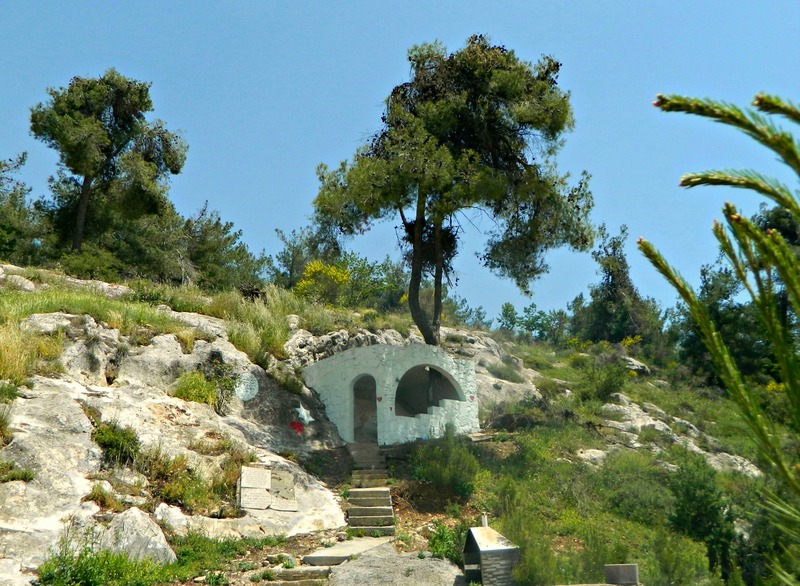 Beside the stately grave is a huge wild pistachio tree known fondly as the “Tree of Mercy”. 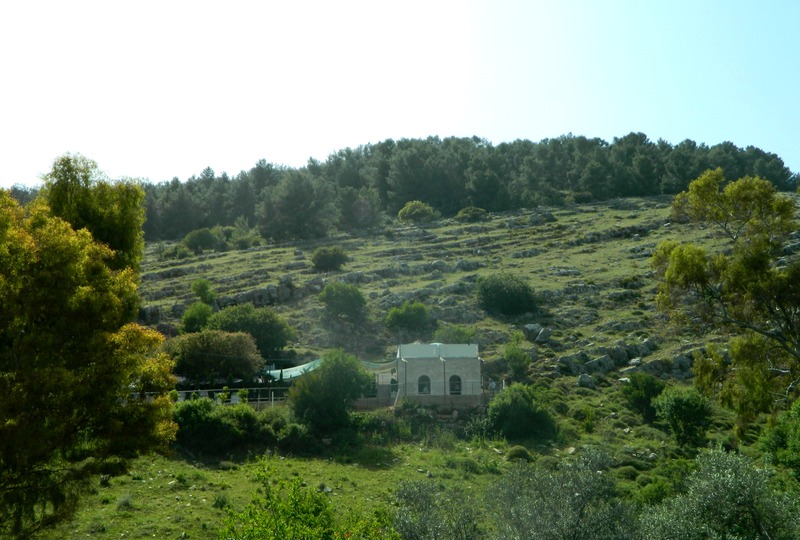 Leaving Kadita and heading back to Road 89, we turned into the Biriya Forest at Ein Zeitim Junction. Once again leaving the main road, we found ourselves on one of the many scenic forest routes and paused for a quick look-see at Ein Gever spring. Next we paused to admire the grove of pistachio trees in KKL-JNF’s Pistachia Valley, followed by the first of our main destinations: the Nevoraya Synagogue. Built sometime in the 100’s CE, the synagogue served the Jewish villagers on and off for some 600-700 years, with three known stages of construction. Discovered in 1861, the excavations began in 1905 and today the site was lovingly reconstructed and presented with informational plaques and even interactive activities. At the bottom of the slope to the west we found the joined kever cave of R’ Eleazar of Modi’in and R’ Ya’akov of Nevoraya. Being the uncle of Bar Kochba, R’ Eleazar HaModa’i took part in the rebellion against the Roman governor Quintus Tineius Rufus and his troops at Beitar – however it is believed that Bar Kochba suspected his uncle’s allegiance and, subsequently, had R’ Eleazar killed (the tragic story can be read HERE on Wikipedia). 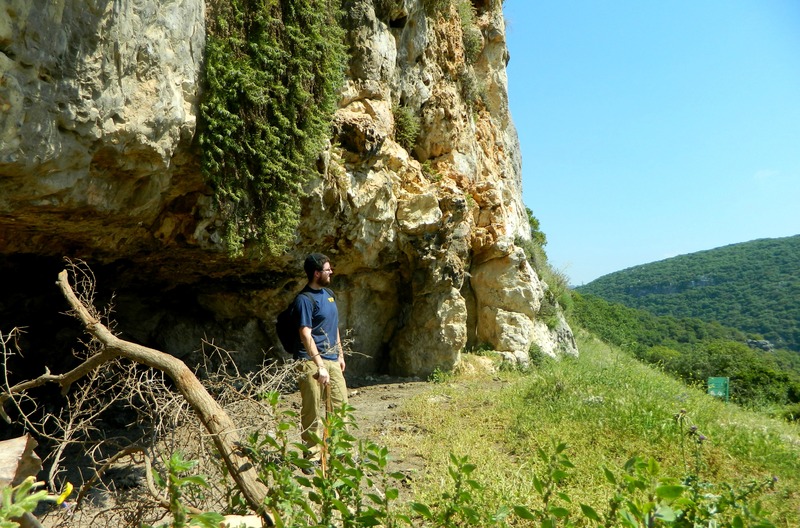 Leaving the cool burial cave we drove up the adjacent hill in search for an ancient lime kiln. We didn’t see it from the car, but found a nice lookout of Ein Nevoraya spring where the sounds of the frogs croaking below was surprisingly loud. 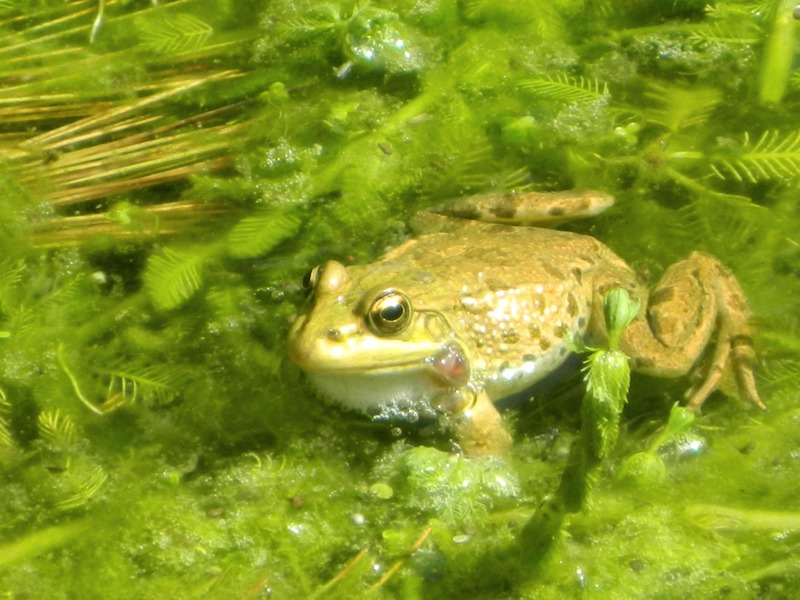 I took a short video of the spring with the frogs that you can see HERE. Descending the hill we stopped briefly at the spring where I just stood and took multitudes of photos of the multitudes of frogs. From there we made a bee-line for Amuka, our second main destination. 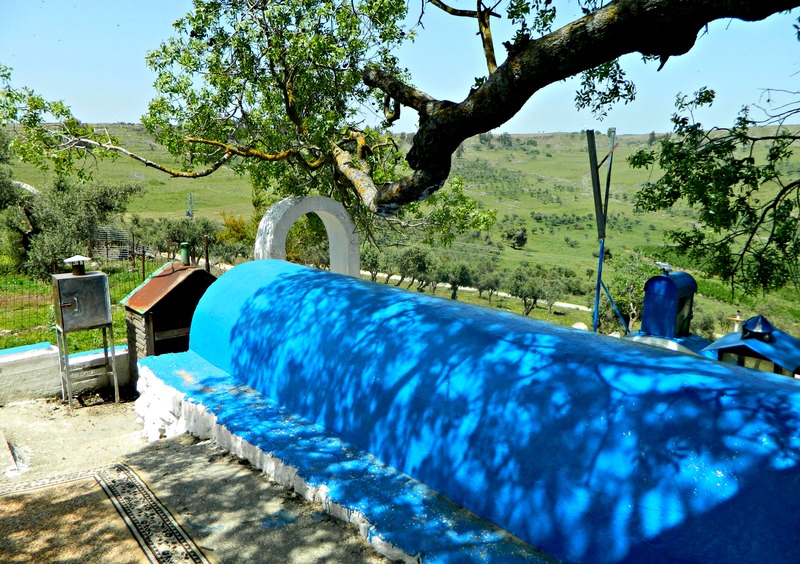 Home of the kever of R’ Yonaton ben Uziel, Amuka is famous for being the place where single adults come to pray for a spouse. So, I did that there. On the way back home, so to speak, we stopped at the KKL-JNF Cedar Lookout and listened to the nice audio info station presentation describing the surrounding pine tree forest. And, last but not least, a visit to the Biriya Fortress – a place I’ve wanted to visit for quite some time now. Back in 1945 Jewish settlers under the mantle of the Palmach took the mountaintop and built the fortress as a defence post and waystation for Jews immigrating from Syria. It wasn’t long before the British had a say in the matter and took the fortress from the Palmach. After a valiant attack/protest, the British relented and the fortress became a symbol of success and perseverance. 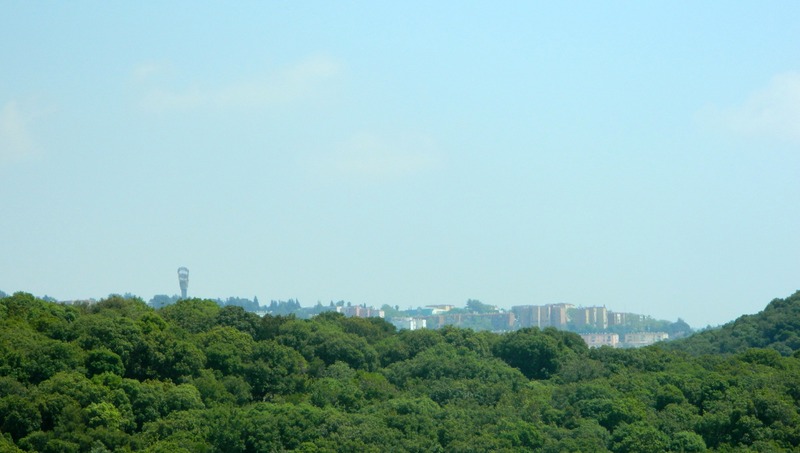 While we were there, a drama school was filming a little something about Nicanor and the Romans, and we had to scurry about from room to room – ending off with a grand view from the main tower of the outlaying Biriya Forest and even the Hula Valley far out in the distance.